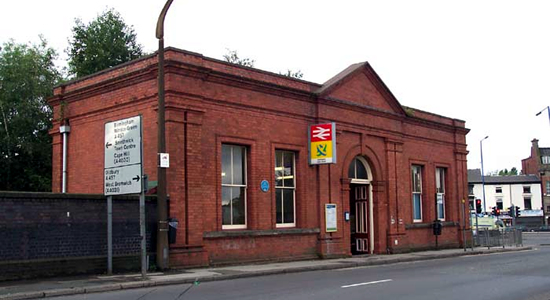 Opened by the LNWR in 1852, Smethwick Rolfe Street has undergone considerable 'rationalization' over the yeas but has still managed to maintain some original character. Above we see the original station building on Rolfe Street itself that has survived in tact without even the customary bricking-up of any of its windows! It is good to see a station that has been sensitively handled. 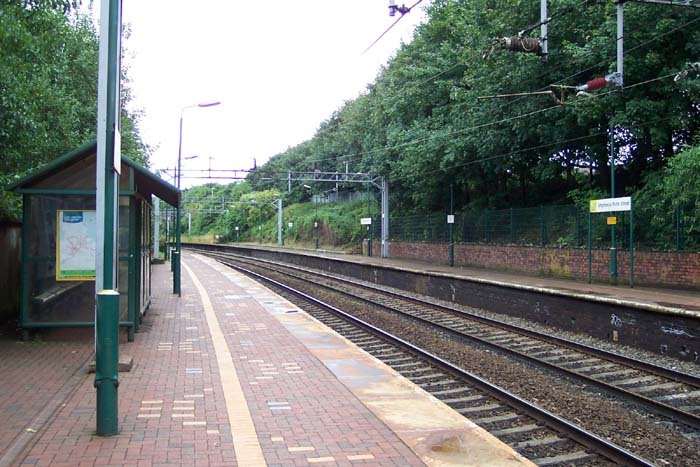 In terms of railway history, Smethwick Rolfe Street has led a fairly inauspicious existence but is very much worth a visit. 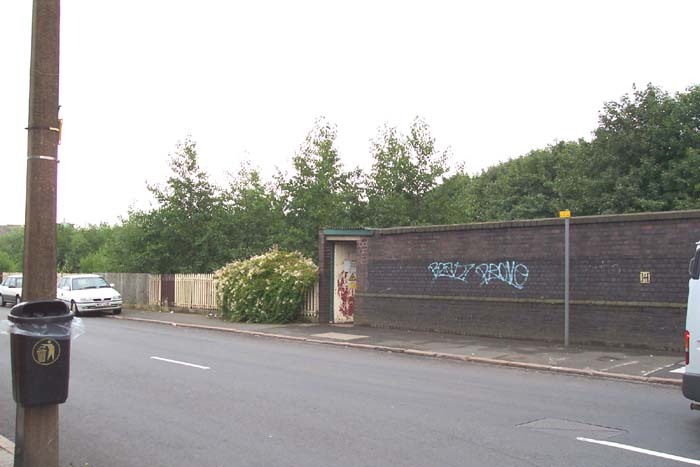 Above-left we are standing on Rolfe Street at its junction with North Western Road. Ahead in the wall is the inconspicuous doorway leading to a stairwell down to the Birmingham platform: the station building seen at the top of the page is further along the wall off camera to our right. 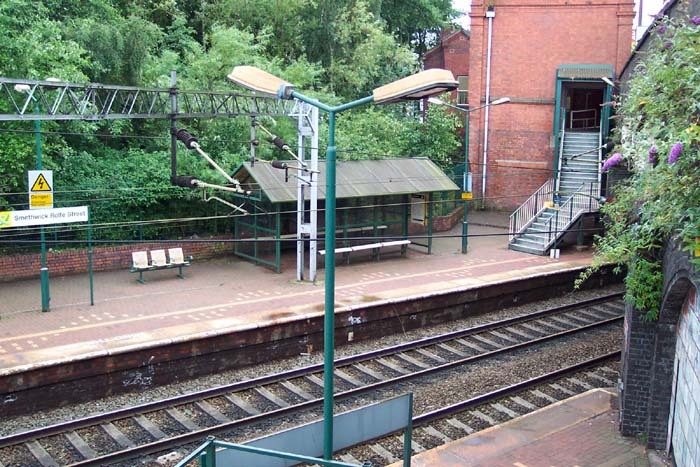 Above-right we have passed through the doorway and are at the top of the staircase down to the Birmingham platform. Ahead and right we can see the side of the station building and the staircase down from it onto the Wolverhampton platform. Above-left we are now on the Birmingham platform looking in the direction of Wolverhampton: certainly at this point there is little to signify that much remaining of historical value exists here. 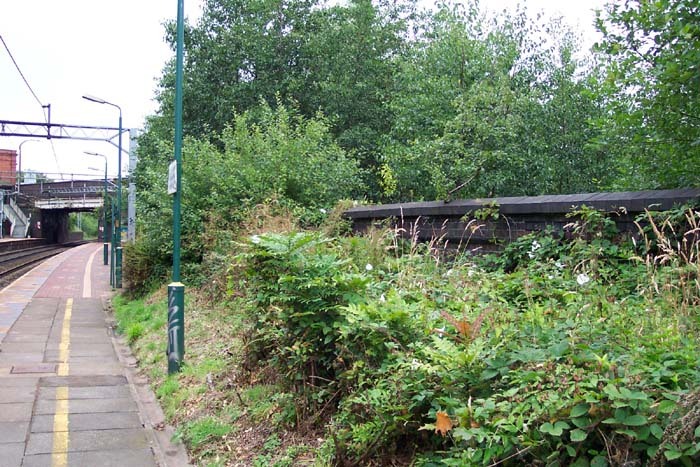 However, above-right looking towards Rolfe Street bridge we can see a bricked-up archway at the end of the platform that originally led a single goods line through from sidings the other side of the bridge to a goods yard to the right and rear of the photographer's position. This is also interesting as it demonstrates that this end of the platform is not originally but was build-up upon the sealing of the tunnel: originally the platforms here were staggered. Above-left we are looking towards Birmingham from the Birmingham platform and can see Cross Buttress Way bridge ahead and to our left, although not entirely discernible in this shot, is the beginning of the foliage that now heavily obscures the land once occupied by the goods workings here. 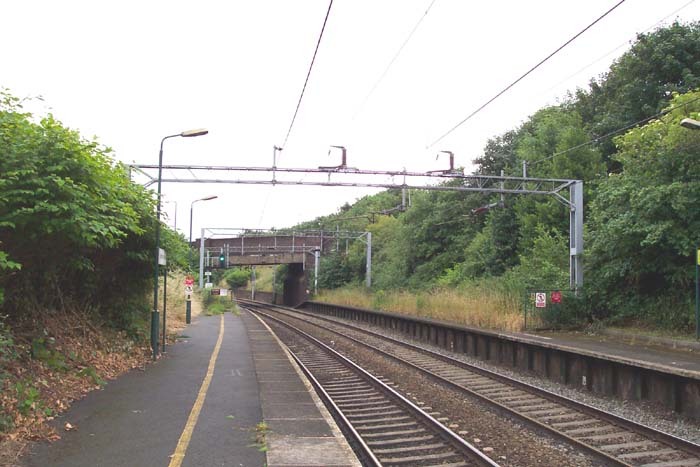 Above-right we have turned around to look back to Rolfe Street bridge and on the right we can get a glimpse of the blue-brick wall that once acted as demarcation between the passenger and goods facilities. 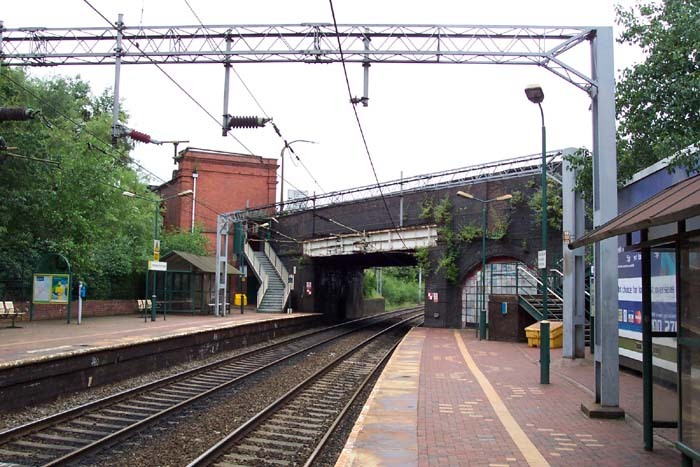 Above-left we have exited the Birmingham platform through the doorway onto Rolfe Street and turned to our right. 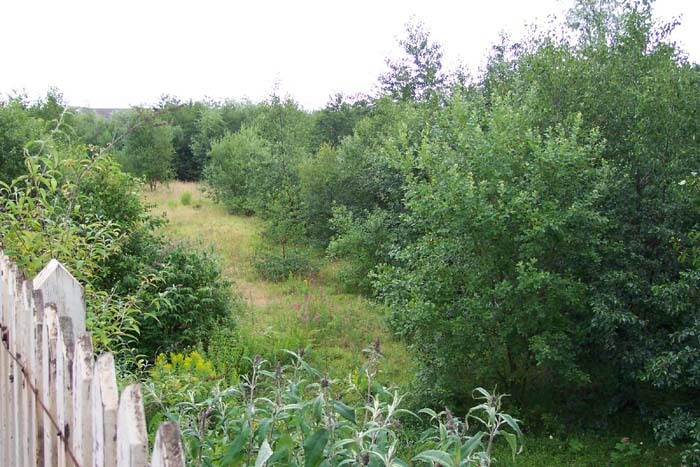 Over the railway picket fence, just seen in the bottom of the shot, we can see the land that once housed the goods yard for the station, now heavily overgrown. 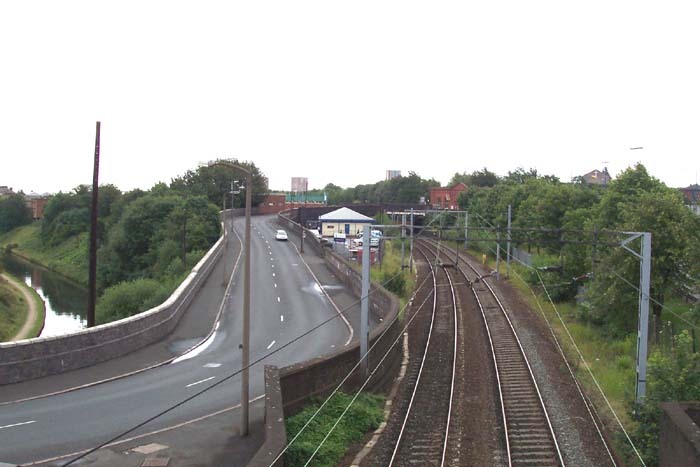 Above-right, we have taken a walk along North Western Way and climbed a footbridge over the railway to look back at the other side of Rolfe Street bridge from the station. The land ahead-left now occupied by the building with the white fronted pitched roof once housed wagon sidings. This is an interesting site and I would recommend anyone interested in the history of the region's railways to have a good look around.